The Baahubali films highlight that even violence can be lyrical, that inventive imagination can bend and break barriers. Baahubali: The Beginning, the first film of the Baahubali series, hit us like a jolt. And it did so because Indian cinema hadn’t seen a film mounted on such a big scale, promising such a spectacle. Nearly nothing about it was commonplace, and almost everything remarkable. Whether it was Shiva (Prabhas) trying to climb a ginormous waterfall, the architectural splendour of the Mahishmati kingdom or the frenetic and kinetic, often jaw-dropping, battleground sequences. As if S. S. Rajamouli, Baahubali: The Beginning’s director, was challenging the very meaning of opulent and grand, heightening the melodrama so much and so often that it looked believable. And to top it all, the film ended on a terrific cliffhanger, a question that managed to sustain its potency for nearly two years: Why did Kattappa (Sathyaraj) kill Baahubali? So Baahubali: The Conclusion (a sequel to Baahubali: The Beginning) – which aims to tie the loose ends of the first part, while telling its own story – isn’t a standalone film. And that is both its boon and bane. Boon because, unlike the first film, it doesn’t have to set up a world or introduce its characters; it can dive straight into the story, keeping the audiences hooked through a compelling narrative and majestic visuals. Besides, Baahubali: The Conclusion, even though more plot-heavy than its prequel, is still a fairly predictable fare. Sure, we await the answer to the Kattappa-Baahubali question, but beyond that, we know how the film will end – which is understandable, epics aren’t known for surprise endings. Baahubali: The Conclusion, however, is battling some complications of its own making. Having said that, the sequel, just like the prequel, starts on a strong note. Rajamouli begins Baahubali: The Conclusion in flashback, showing Amarendra Baahubali’s initial days as Mahishmathi’s king and how he fell in love with Devasena (Anushka Shetty). And it is heartening to see that the film’s female lead, Devasena, has more power and agency than Baahubali: The Beginning’s heroine, Avanthika (Tamannaah). Because even though Baahubali: The Beginning was a heart-thumping heady ride, it had its disquieting moments: Tamannaah’s Avanthika was almost used as a prop, her mission hijacked by Shiva; a romantic song, picturised on the two, was problematic, for her consent wasn’t clear; the soldiers of the warring kingdom, Kalakeyas, were black brute savages, reinforcing a colonial stereotype. But Baahubali: The Conclusion sets those flaws right by making Devasena her own woman. The daughter of Kuntal Desh’s king, Devasena is a fierce warrior, slaying her opponents with ease, while maintaining her calm and composure, much like the franchise’s heroes. She’s strong-willed, too, holding her own against Sivagami (Ramya Krishnan), the matriarch and the queen mother, rejecting some questionable practices of the Mahishmati kingdom. There’s enough plot-wise in Baahubali: The Conclusion’s initial segment to keep you interested. Rajamouli revels in Baahubali’s superpower: his hero crumbles giant doors, pulls a huge chariot, tames elephants. The romantic subplot, too, is enjoyable (and although its comedic track is a bit on the nose, there’s nothing here that’s particularly jarring). Rajamouli, just like in Baahubali: The Beginning, keeps finding ways to treat us visually, unleashing his untrammelled imagination on us with full force. So a battleground scene has numerous bulls charging towards the Kuntal Desh with flaring horns. Baahubali rescues Kuntal Desh’s subjects by opening a dam that drowns the warring army’s soldiers. A few scenes later, a boat becomes airborne, tearing through clouds, surrounded by cloud-shaped horses. Rajamouli nails the macro – the battle sequences, the big fight, the hero landing the blows, the villains flying in air, anything epic is underlined with a capital-E – but seems indifferent to the micro: the small scenes that allow us to know the characters better, the intimate moments between them. The latter is conspicuous by absence. In fact, only one scene in the film – between Kattappa and Baahubali, moments before the latter’s murder – carries true emotional heft. 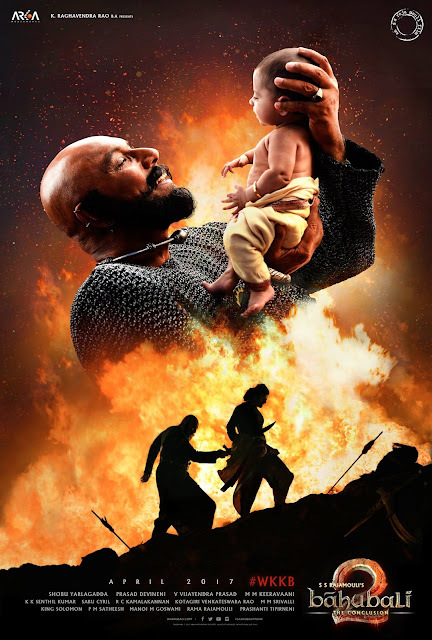 Otherwise, Baahubali: The Conclusion is a litany of adrenaline rush, which is fine and enjoyable on its own terms, but this would have been a better film had Rajamouli thrown some heart in the mix, too. But it’s notable and impressive that Baahubali: The Conclusion is tonally consistent – not just with this film but also with its prequel. K.V. Vijayendra Prasad (who’s written the story) and Rajamouli (credited with the screenplay) smoothly make the film transition from one part to next, giving every subplot its due, every character motivation its adequate reasons. No part of the plot is played for shocks or results from lazy writing. Even the most important and dramatic revelation, the first film’s cliffhanger, is believable. And with the exception of one bit that feels contrived, Sivagami realising her mistake, the rest of the film is marked by sure-footed plotting. The fact that both Baahubali films are riveting and enjoyable should act as a wake-up call for some Indian filmmakers, especially those known for making tedious actioners. Because, unlike their films (centred on cops, gangsters, hitmen), Baahubali is set in a make-believe world, employing the same melodramatic tropes, especially in action sequences (a hero vanquishing scores of opponents, all by himself), and yet Rajamouli’s is a more believable, more enjoyable, fare. And it’s so because Rajamouli assiduously sweats the small stuff. In the world of Baahubali, even the action sequences are laced with reasons. The characters’ modes of attack – such as an ingenious sequence in the film, where Shiva’s soldiers are launched into the Mahishmati kingdom on the back of palm trees – are inventive and original, sucking us deep into this world, keeping us hooked, making us care. It also helps that Rajamouli unabashedly adores his heroes, presenting them as beings capable of anything. They uproot trees, tame elephants, crack bricks, rain arrows. He shoots his action sequences (K. K. Senthil Kumar’s cinematography is brilliant) like someone would choreograph songs. Nothing is ordinary; everything is elegance personified. Shiva and Baahubali gracefully slide onto the ground after a huge jump. They wield their quivers and swords like a musician holding a violin. Blood almost always drips slowly; sometimes it runs in rivulets. Baahubali is, of course, an epic, so not every film can follow its model, but Rajamouli has at least paved the way, showing how even violence can be lyrical, that inventive imagination can bend and break barriers. Both Baahubali films, though, make for strange bedmates. Baahubali: The Conclusion is superior to Baahubali: The Beginning – in terms of plot, characterisation, VFX, even dubbing (the prequel suffered from some awkward translation) – and yet, the first, deliriously original and new, was more enjoyable, hitting us like a sack of bricks. Baahubali: The Conclusion hits us too, but some of the impact is diluted by familiarity. It isn’t Rajamouli’s fault though; he, and his team, should go home proud.